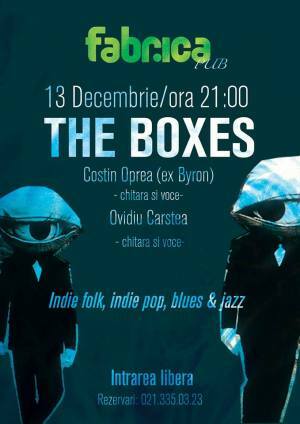 The Boxes is an indie folk project from Bucharest with rock, blues, jazz and funk influences. From deeply sad songs to rather fresh rhythms, they focus on the song to tell a story that comes from the heart and create an emotion-filled atmosphere in the audience. The jazz voice of the lead singer, accompanied by acoustic guitar, bass, keyboards and drums, with bursts of electric guitar, percussion, oboe, trumpets and glockenspiel, will hopefully make one cry, remember a loved one, think of one's childhood or the future. Or simply relax and take things easier for a while. "The Boxes live! @ Fabrica" Concert in Bucharest. You can get here description, reviews, address, time and details of "The Boxes live! @ Fabrica" Concert in Bucharest. Visit Bucharest Tips for more Concert events in Bucharest!